Turn back the clock to a different time, listen to Bing Crosby sing of sleigh bells in the snow, as the realities of America's involvement in the Second World War change the lives of the Turner family in Laf ayette, Indiana. I always love holiday books around this time when the weather gets cold, the days are shorter and all I want to do is snuggle down in the blankets with a good book! I definitely loved snuggling and reading Where Treetops Glisten by some of my favorite authors all in one book! These three authors are definitely in my top 10 of favorite historical fiction authors so I love that they collaborated! This book was a great historical Christmas book and I loved the setting, the romance, the characters, the story line and the history! It had me eager to read each little novella to meet each character and then finish the book in a hurry to see how they all worked out together as a family! 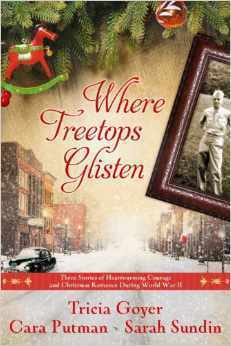 If you are looking for a excellent historical holiday read, definitely get Where Treetops Glisten!